Toulouse Gold Dining Table - 96"
Other Size Options 78" 112"
Named for the French city, also known as La Ville Rose, the Toulouse Gold Dining Table is reminiscent of the city's old world French style and the region the top is sourced from. The Toulouse boasts a 1 1/2" thick FSC certified French Oak wood top, with a live edge finish and double dovetail joinery. 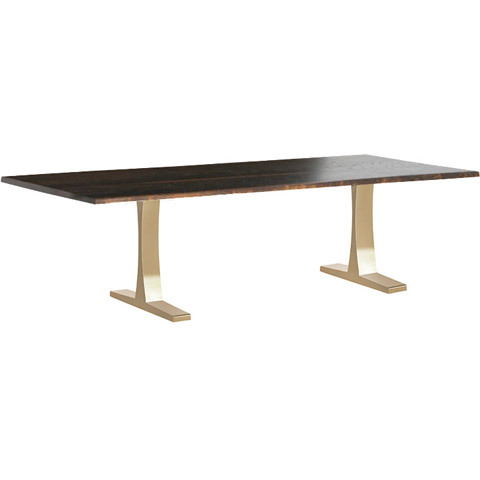 The contrasting brushed gold steel legs ensure the Toulouse is a bold statement piece for your modern dining room. Choose from three sizes that seat six, eight or ten. Top is finished in a Seared Oak stain. See the entire Toulouse Collection.